Whenever I make chili I usually bake cornbread to accompany it. Which I did last time but then I forgot to take a final picture of it so all I was the raw mixture to show off. Not quite the look I was going for. And would you believe I nearly forgot again this time round?!? This is a quick bread that is traditional with chili and is great served hot so the butter just melts into it. I use Indian Head brand corn meal for the bread and follow their recipe on the back. In one bowl combine 1 cup corn meal, 1 cup flour, 1/4 cup sugar, 3 teaspoons baking powder and 1 teaspoon salt. In another bowl combine1/4 cup oil, 1 cup milk and 1 egg beaten. 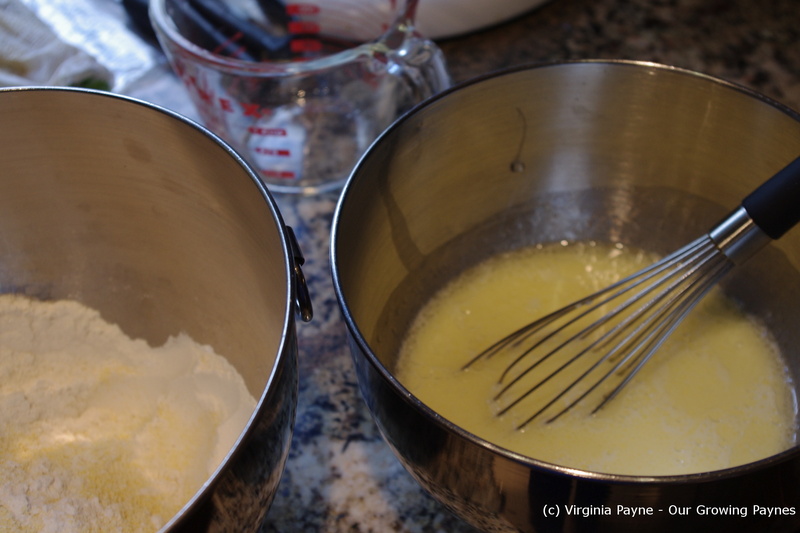 Add the wet mixture gradually to the dry ingredients. Mix until smooth. Pour into a 9 x 9 x 2 pan that is greased. Pop into the oven for 20-25 minutes until baked. You want the toothpick to come out clean when you do the test. 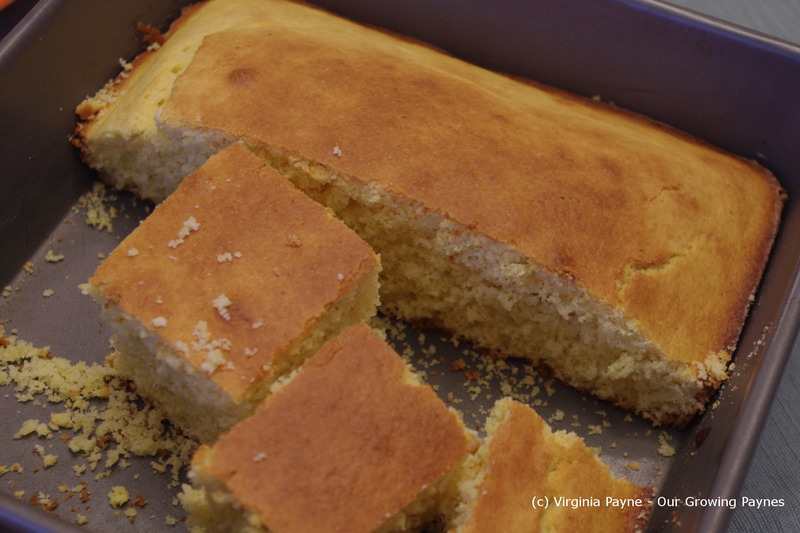 This entry was posted in Baking and tagged baking, bread, butter, corn bread, cornbread. Bookmark the permalink. 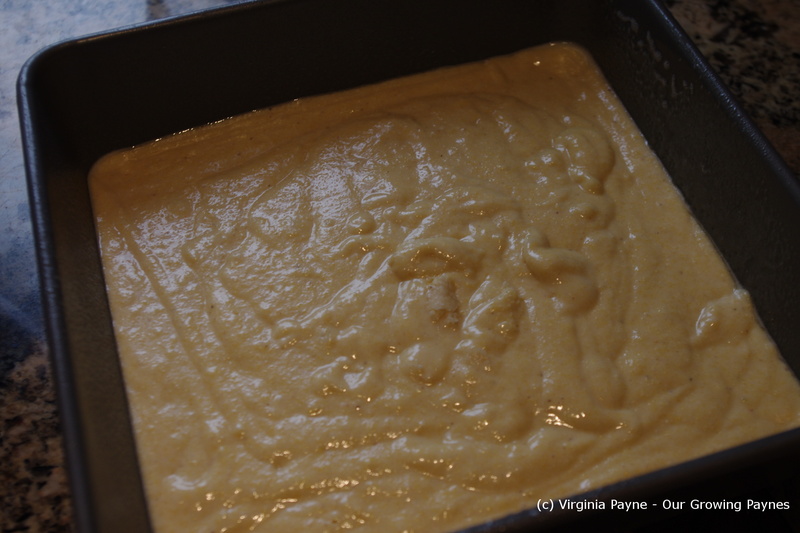 I made cornbread once – never done it before and I had no idea what it was going to turn out like – its more like a cake thing isnt it – mind you it does, as you say, go very well with chilli! chili and cornbread… mmmz nothing better.. I know! It’s like bacon and eggs…. This is so funny, now taking the photos is as important as the food! 🙂 For me too! Oh I know, cooking has become a big production! But I figure at the very least it is a nice online journal for the kids down the road. I think it probably came about as something easy to cook as the people expanded into the west. It is something you can easily make over the fire. I hope you enjoy it. It is on the crumbly side but is a good alternative. Cornbread and chili and a great pairing…your looks good.